Madre Labs® Moisturizing Shampoo gently and thoroughly cleansers your hair and scalp. It delivers the benefits of our proprietary blend of Antioxidant-Rich SuperFruits (Açaí, Goji, Pomegranate and Seabuckthorn), which helps protect your hair and scalp from oxidative and environmental damage. Aloe Vera, Amino Acids, Panthenol have been added to further nourish and moisturize dry, damage hair. The result is softer, shiny, more manageable hair. "NO No-No's" is one of our trademarked logos, signifying that our chemists have included the highest quality ingredients available in our products - without using sulfates, parabens, dyes, animal testing or animal ingredients. Our products are "green," gentle, biodegradable and the ingredients used have received excellent safety ratings. Our formulators referenced multiple safety and natural product databases to ensure that our personal care formulations are of exceptional quality. Gently shake before each use. 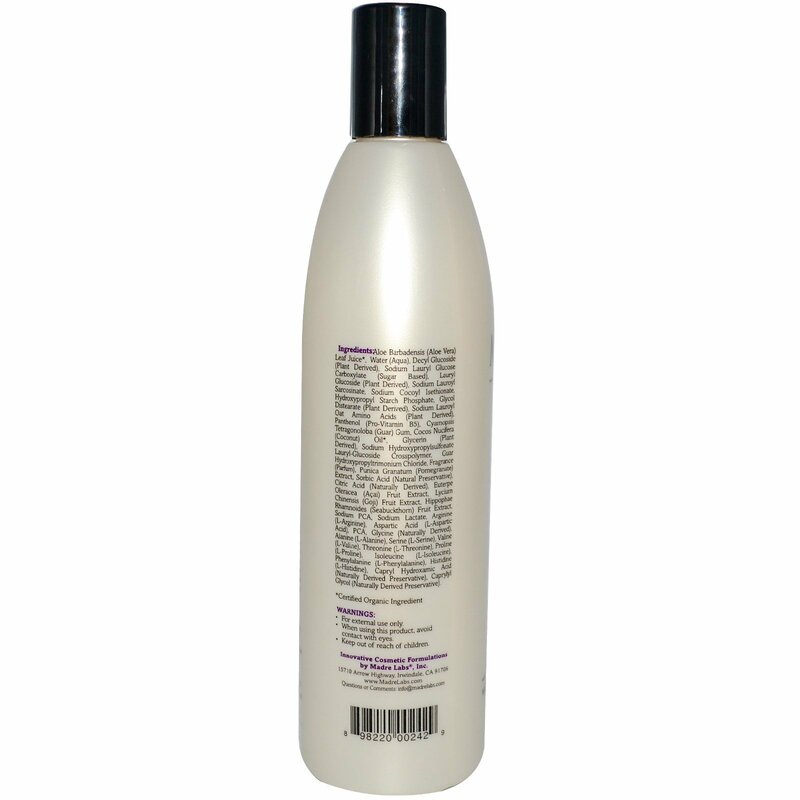 Massage a generous amount of shampoo onto wet hair and scalp. work into rich lather. Rinse thoroughly. 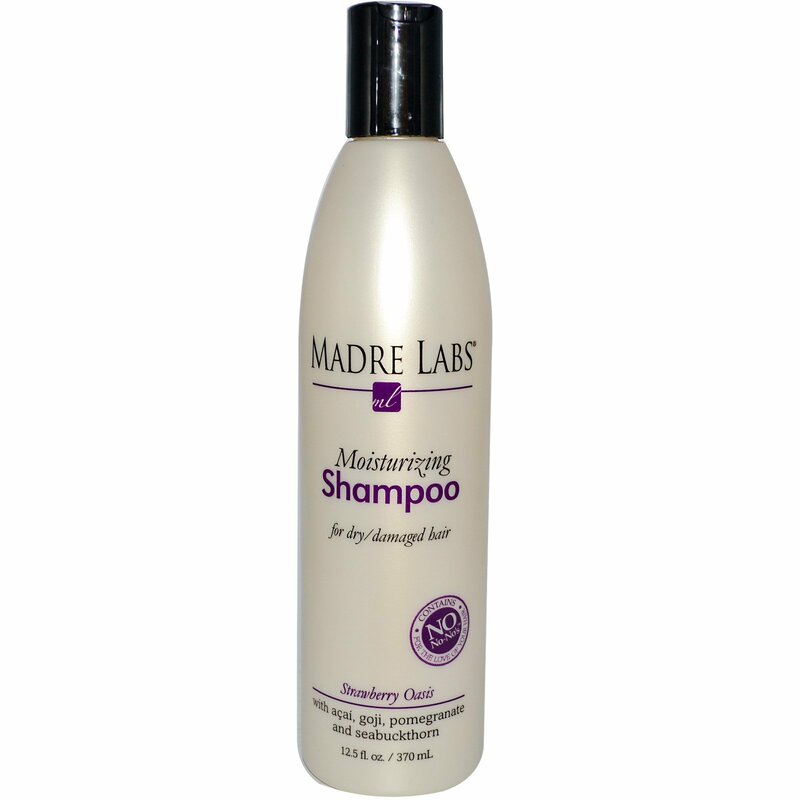 For best results, follow with Madre Labs® Moisturizing Conditioner. May be used daily. Aloe barbadensis (aloe vera) leaf juice*, water (aqua), decyl glucoside (plant derived), sodium lauryl glucose carboxylate (sugar based), lauryl glucoside (plant derived), sodium lauroyl sarcosinate, sodium cocoyl isethionate, hydroxypropyl starch phosphate, glycol distearate (plant derived), sodium lauroyl oat amino acids (plant derived), panthenol (pro-vitamin B5), cyamopsis tetragonoloba (guar) gum, cocos nucifera (coconut) oil*, glycerin (plant derived), sodium hydroxypropylsulfonate lauryl-glucoside crosspolymer, guar hydroxypropyltrimonium chloride, fragrance (parfum), punica granatum (pomegranate) extract, sorbic acid (natural preservative), citric acid (natural derived), euterpe oleracea (açaí) fruit extract, lycium chinensis (goji) fruit extract, hippophae rhamnoides (seabuckthorn) fruit extract, sodium PCA, sodium lactate, arginine (l-arginine), aspartic acid (l-aspartic acid), PCA, glycerin (natural derived), alanine (l-alanine), serine (l-serine), valine (l-valine) , threonine (l-threonine), proline (l-proline), isoleucine (l-isoleucine), phenylalanine (l-phenylalanine), histidine (l-histidine), capryl hydroxamic acid (natural preservative), caprylyl glycol (natural preservative). No – sulfates, parabens, dyes, animal testing, animal ingredients. Disclaimer:Delivered products' labels (formulas and ingredient declarations) may be different than what appears on iHerb.com. However, we do our best to ensure that you receive the most recent product formulation and data provided by the manufacturer.